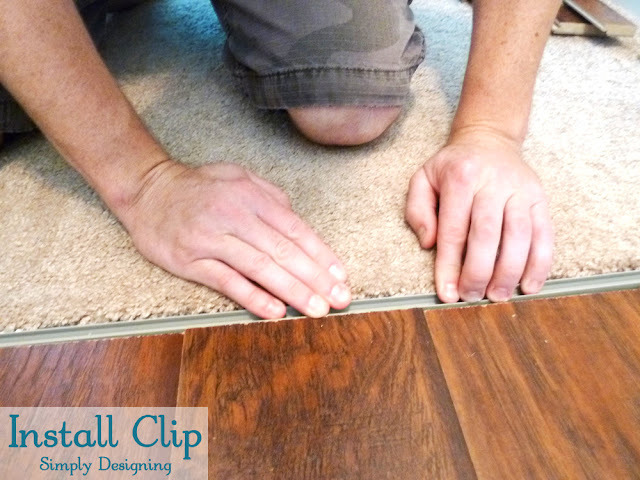 This is part three of our complete series to teach you laying and installing laminate flooring yourself. 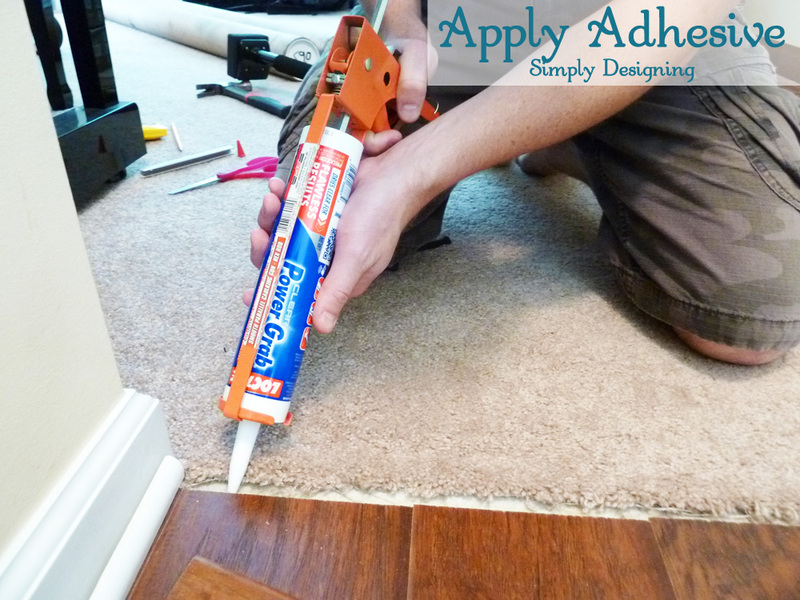 This part focuses on installing the trim molding and how to choose transition strips and install them as well to complete your project. Be sure to read Part 1: The Preparation and Part 2: The Installation first! After our floors were prepared and we installed our tongue-and-groove (aka click-and-lock) floating laminate flooring, we were ready to put the finishing touches! As I mentioned earlier, we decided not to remove our door frames or our main molding, but we did remove our quarter round. 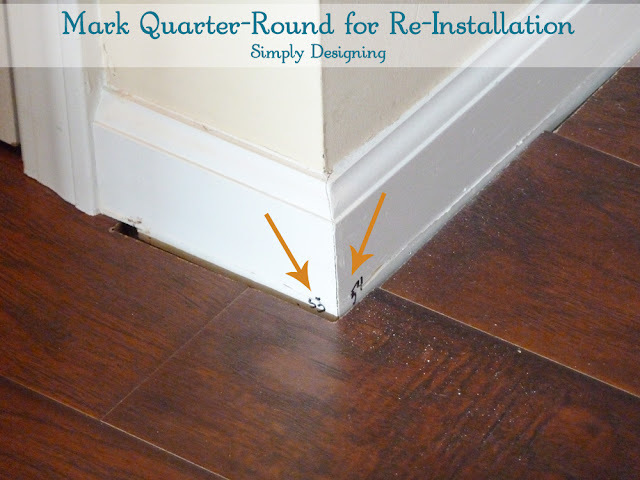 My husband had the brilliant idea to number all of our quarter rounds so that we knew exactly where to re-install it at. Genius. This made re-installation an absolute breeze! All we had to do was match the numbers back up and use our nail gun to reattach the molding. We started by using our traditional nail gun that needs an air compressor to work. It works well, but it is an effort to set up, it takes time for the air compressor to be ready to run, and it is stinkin’ loud! Plus, you have to drag a big long cord with you everywhere! Bleck. It works great but is kind of a pain sometimes. However, like many people with young children, we do a lot of our DIY work when our children are in bed. Power tools + curious 3-year-old boys = disaster! So for the safety and sanity of our family, much of the work on our flooring has been done after the kids are in bed. So after 8 pm at night. We live in a nice neighborhood, and we don’t want to upset our neighbors…and our air compressor is SO loud! We felt like we couldn’t run it much after 9 pm at night. 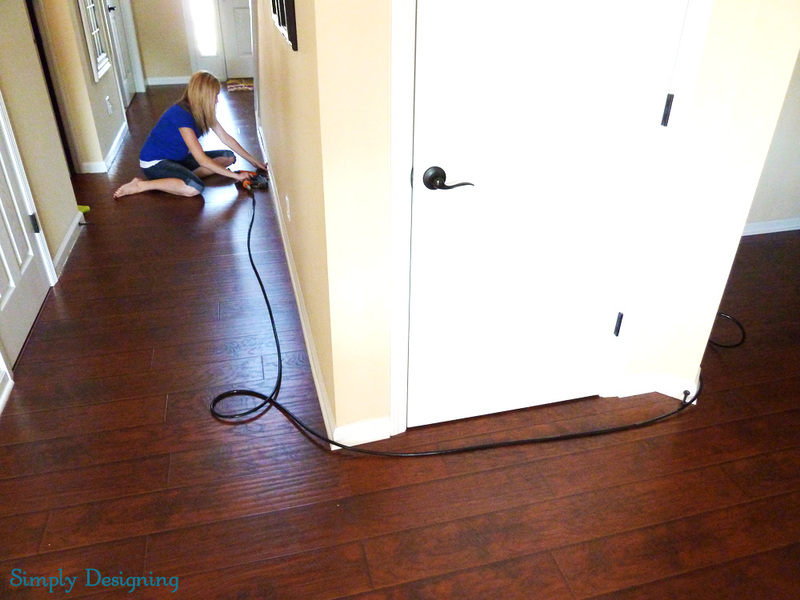 Which meant, if we were lucky, we had a little over an hour to for installing laminate flooring at night. This meant progress was very slow. 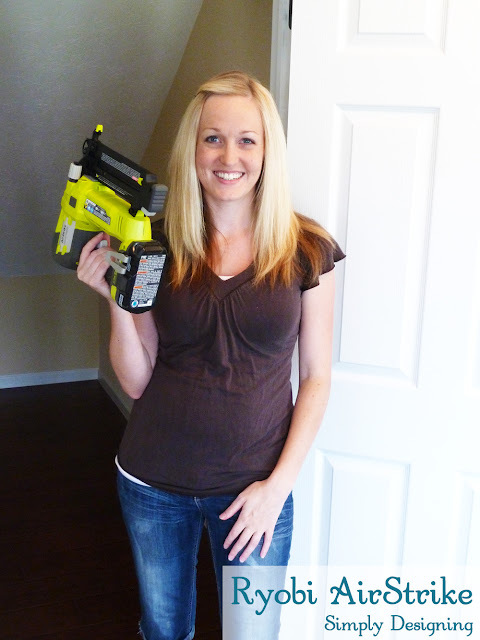 Enter…..the-world’s-coolest-awesomest-neatest-handiest Power Tool from +RYOBI Power Tools! I was able to try the Ryobi AirStrike a few months ago at Haven and fell in love! I also knew this would help our slow-going project move a little faster! So I was really thrilled that Ryobi agreed to send me one to check out! Woot woot! The Ryobi AirStrike was simple to use, easy to handle, and gives you the EXACT SAME RESULTS of a nail gun with a compressor, without the cords, noise or compressor! So with no air compressor noise and the same power as a traditional nail gun, we were able to quickly and simply re-install ALL of our quarter round molding in a cinch! And even though the AirStrike is battery powered, I was able to get all of my molding attached without needing to recharge it and all of the nails went in FLAWLESSLY! I didn’t have any nail heads that needed to be tapped in or fixed. They seriously went in perfectly! 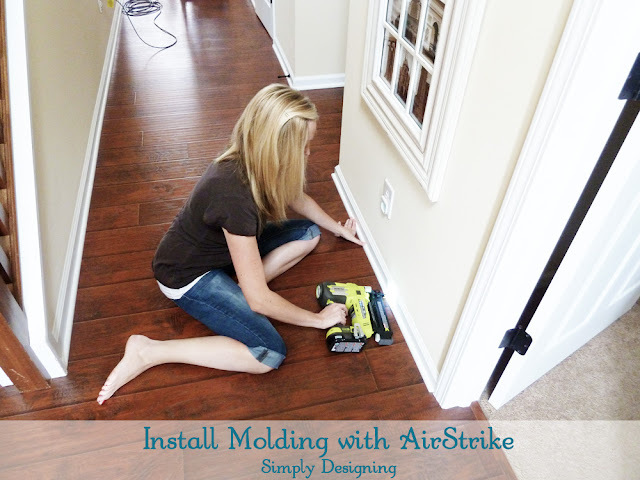 You can pick up an AirStrike at any +The Home Depot store or by ordering it HERE from Amazon. Don’t forget to pick up a battery too (here). After you have re-installed all of your molding and/or quarter round, you will want to calk the edges and corners, fill in any nail holes, and re-paint it for a nice, professional finish. Along with all of our weird angles, corners and door jams, we also have 5 transitions in our space! Four between our newly installed laminate flooring and existing carpet. 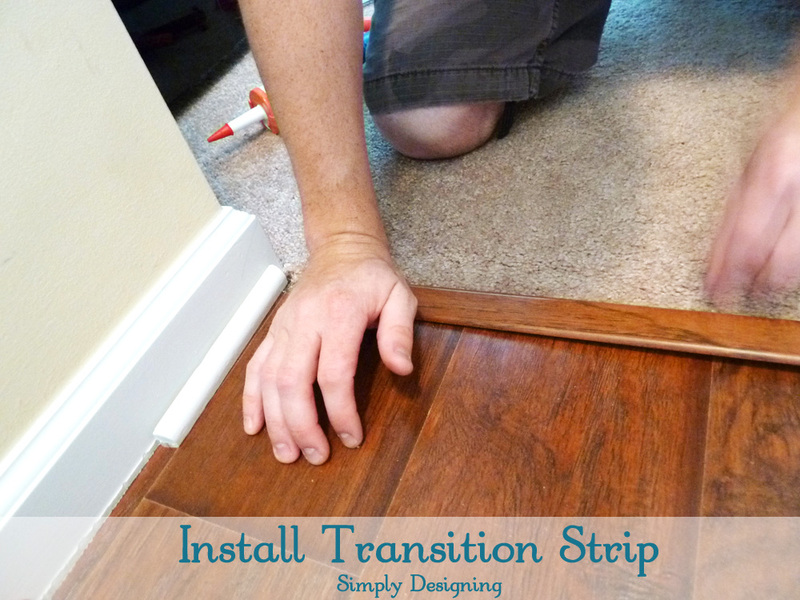 There are several types of transition strips so be sure to choose the proper one for your space. T-Molding transitions are for transitioning from your wood flooring to another same-height hard surface flooring (like tile). End-Caps are good for when you are transitioning from your wood to carpet. 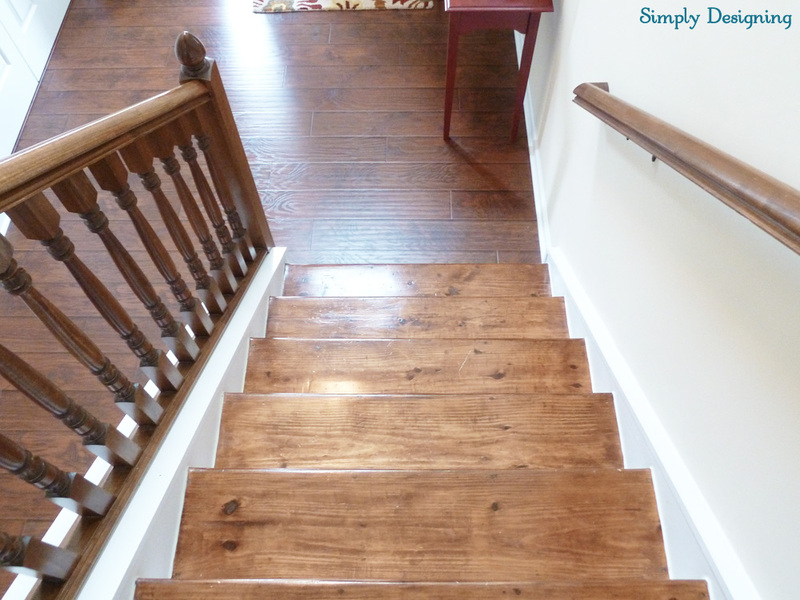 Reducer transitions are for step-down instances where you are transitioning from your wood to another surface that is at a different height. 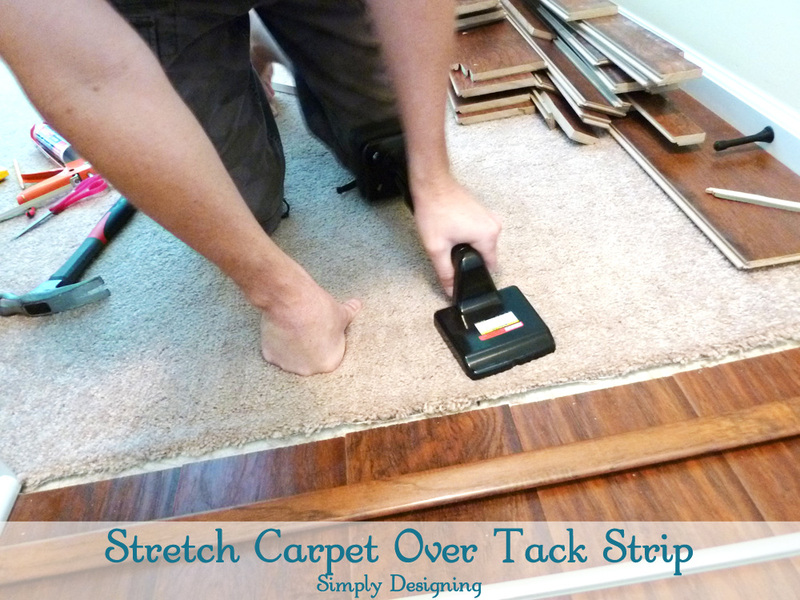 We took our laminate up to four different carpeted areas and each of those areas needed to have carpet trimmed, a new tack strip put in place, and the carpet stretched to fit over the tack strip well. Next, you need to install your transition strip. Our t-molding transitions came with a plastic clip that the molding sits into that you need to first install. We installed ours using a multi-purpose adhesive that secured it tightly to our concrete sub-floors. If you have wood sub-floors you could quickly nail gun this down. After that is in place you will set your transition strip into the clip! And you are done! All molding kits and transition strips will come with instructions, so please always refer to your manufacturer instructions for specific details of installation. 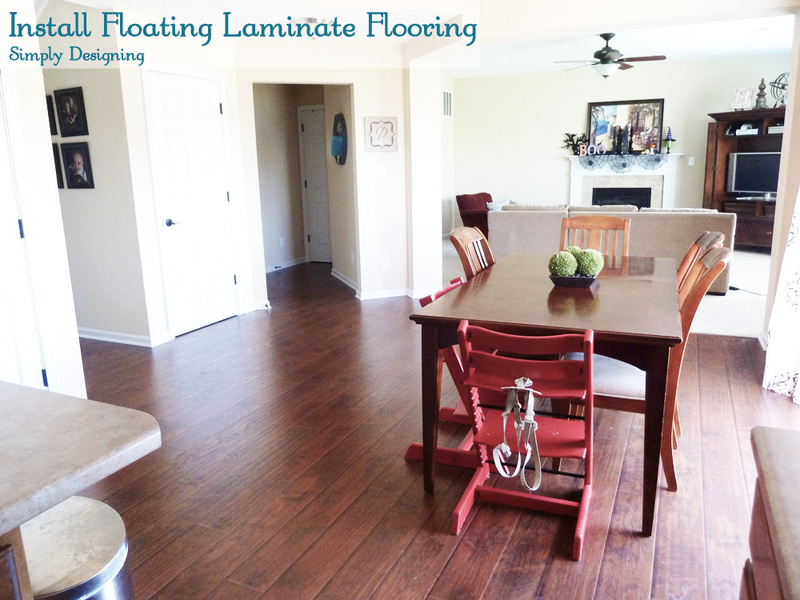 Sit Back and Admire how well you did at installing laminate flooring! I mean really!! We just installed almost 1,000 square feet of new flooring! 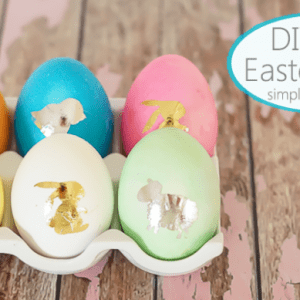 And we LOVE how it turned out! So we decided to just enjoy it! I love your husband&#39;s idea to number the pieces- genius for sure. They turned out amazing. I need to get my hands on some of those Ryobi tools. Oh thank you so much Mique! And thanks for stopping by! resisting the temptation to say something like, I don&#39;t no what is cuter you or that Ryobi AirStrike. whoops. tie! (sorry Mr. Ashley) and anyway thanks for introducing us to this new tool and thanks too for the incredibly thorough tutorial. best of luck with the stairs and the other upcoming projects. It looks fantastic! I would love to get my hands on some Ryobi tools like that AirStrike! Thanks so much Jessica! 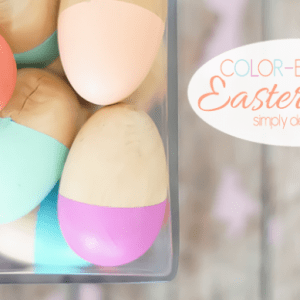 It is a fabulous tool!! You would love it! You always impress me with your skills and confidence with tools! I might even be able to handle that Ryobi tool… maybe. Awesome post! And that nail gun does sound fantastic. Because, ya, power tools, noise, and three year olds don&#39;t mix. 🙂 Your floors look BEAUTIFUL too! And I love the pictures of you working on it with your pregnant belly, lol. 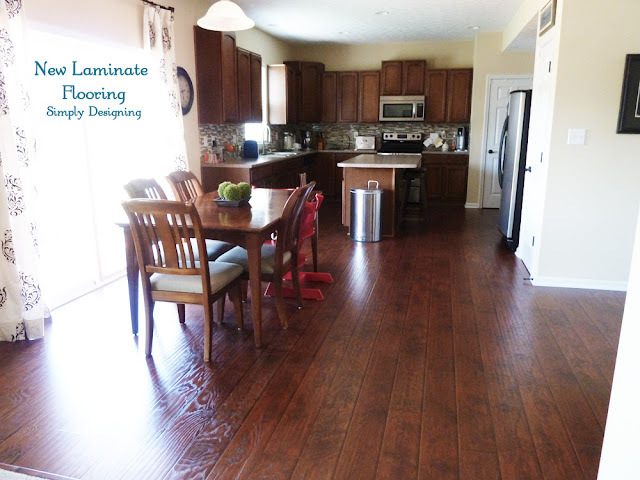 Wow your floors look fantastic! The nail gun looks like a blast!! I just bought the Ryobi nailer for a few of my projects, too! (After trying it at Haven) LOVE it!!! 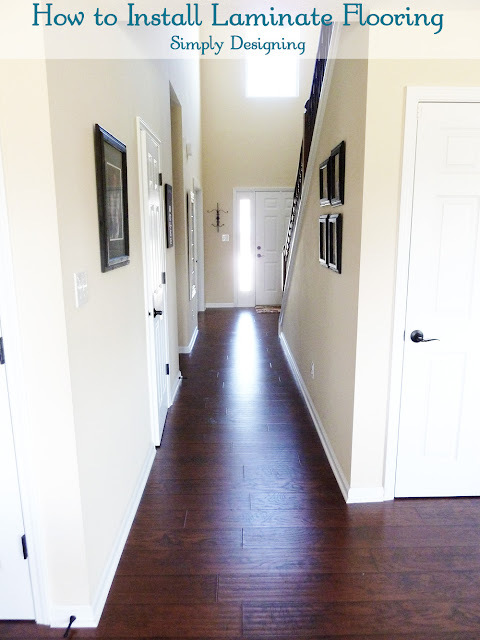 Your floors look great! I bet your floors are looking just lovely! <br /><br />Thank you so much!<br /><br />I honestly wish I had my wall color accessible. Our home was a spec home and this is the paint color it was already painted with! If you take a photo to a paint store though I bet they could help you find a similar color. <br /><br />Good luck!